i.e., F1, F2, and F3 hybrids with an Asian Leopard Cat (ALC), compared to later generations. Below are breakdowns of the amount of ALC blood/genes found in each generation (to 10) of crossing an Asian Leopard Cat with a domestic cat. 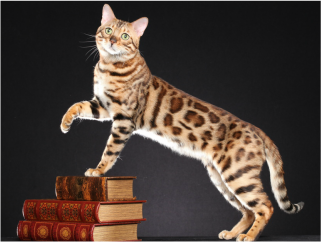 Of course, if the ALC is bred to a cat which already has some percentage of ALC blood/genes (i.e., a Bengal, which is what is usually used nowadays) rather than another breed which would have 0%, then the resulting offspring would have a slightly higher percentage of ALC . The above percentages on the left side show the reason that breeders do not normally track the "F" level much past F6 or so. I have never seen this actually presented all the way to the 10th level, so I did the math (of course, I used a calculator!) and typed it up. At the lower levels, the focus is not on the actual ALC genes/blood, but rather on the similarities (and enhancements) to the Asian Leopard Cat, especially the appearance and personality. Almost no one would want to have a wild adult Asian Leopard Cat running loose in their living room, hissing and hiding. Most people would much prefer a loving, interactive companion cat which LOOKS like an exotic cat but ACTS like a good pet cat (with a few endearing unique traits like playing in water, playing fetch, and walking on a leash). This retention and enhancement of the exotic look while developing a loving temperment are the goals of bengal breeders. Below is a button link to a wonderful 24-minute video presentation on YouTube honoring the retirement of Jean Mill (in 2008), the founder of the Bengal breed. This tribute video by Anthony Hutcherson of Jungletrax Bengals contains a lot of great information about how this amazing breed began and how it progressed through the years to the phenomenal coat patterns and personality we have today!